Our feet are our foundation. By being in constant connection with our brain, they enable us to stand, walk and balance. Our feet can carry several hundred tons of total weight in a single day. In confined spaces known as shoes, we walk up to five miles or 9,000 steps on an average day! In order to do this, the foot must maintain a certain level of tension. With repeated patterns of uninterrupted tension, our feet get tired and sore, thus creating stress throughout the entire body. That’s where do-it-yourself reflexology steps in. By the use of specific hand and finger techniques, along with the application of essential oils to the feet, we can begin to interrupt stress patterns and clear any blockages that occur over time from everyday wear and tear. Reflexology is an energy-based healing art that works through the nervous system. There are zones and reflexes on your feet and hands that “mirror” your entire body. Stimulating these reflexes sends messages to the associated body parts. It relieves tension, improves circulation, aids in the delivery of oxygen and nutrients to the cells, and assists in bringing your body to a natural state of balance. There are many self-care techniques you can do to help ease the discomfort of tired, achy feet and aid the body in its own healing process. Some self-care techniques done on a regular basis, enhanced with the application of therapeutic-grade essential oils, can bring you one step closer to good health. Essential oils are aromatic liquids extracted from flowers, trees, roots, bushes, rinds, and seeds. Each oil essence has up to hundreds of chemical components these complex oils have been used to support health for thousands of years. Essential oils are so small in molecular size that some can be absorbed through the skin. Applying essential oils in proper dilution to the feet is a safe and effective way to deliver their healing properties throughout your body. In order to get the greatest benefit from their true healing powers, it is very important that you chose the highest quality therapeutic-grade essential oils. Are you ready to begin self-care reflexology? Start by doing an ankle rotation exercise. In a standing position, lift one foot up onto the ball of the foot. From this position, rotate clockwise ten times, then rotate counterclockwise ten times. Switch feet and repeat. This helps to relax the foot by loosening the four major muscle groups connecting the foot and leg. The rest of these exercises should be done in a seated position by placing the foot being worked on onto the thigh of the opposite leg. 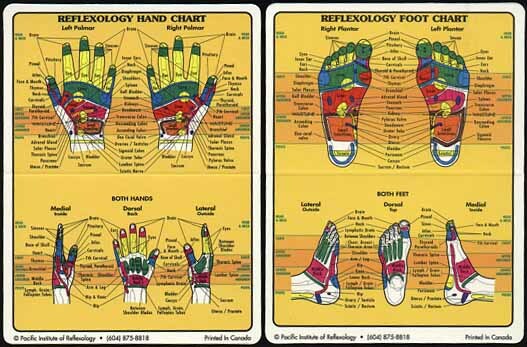 Reflexology is one area in life where you should consider yourself first. Working on yourself is the best way to get started feeling the effects of reflexology. For instance, I began utilizing this therapy as a crisis management plan. When something would hurt in my body, I would go to the corresponding reflex point, and sure enough, the reflex point would be sore. I would rub the spot every chance I got. As the pain went away in my body, the tenderness would go away in my reflex point! Using the techniques on yourself will help you get in touch with your body and its functions.